This Avantco HDC-26 self service. Maximizes your display to increase. Perfect for convenience stores, snack shacks, concession stands, hotel breakfast bars, and all your other pre-made hot food display needs, this warmer offers 1500W of heating power that keeps your wrapped foods hot and fresh. It also makes it easy for your customers to serve themselves and for staff to keep the shelves fully stocked. This item complies with the standards imposed by the Conformance European (CE), a division of the Intertek group. This item meets the sanitation standards imposed by the ETL, a division of the Intertek Group. This unit comes with a NEMA 5-15P plug. Front and Rear Sliding Doors. 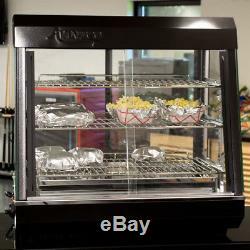 Great for a wide variety of wrapped foods like burritos, breakfast sandwiches, and hot dogs, this 26 display warmer has front and rear sliding doors to encourage your customers to serve themselves and to allow your staff to refill the shelves from behind the counter. Plus, the doors are made of tempered glass for greater strength and safety. This warmer precisely controls interior temperatures thanks to the thermostatic controls. It has a range of 85 to 185 degrees Fahrenheit so that you can choose the best temperature setting for the foods you want to display. Don't wait to begin serving your hot foods! This warmer can reach 120 degrees Fahrenheit within 10 minutes of being turned on. Plus, it will heat to the maximum temperature of 185 degrees Fahrenheit within 20 minutes. Designed for long-lasting durability, this unit features a stainless steel body that is resistant to wear and tear. Also, the sleek black finish is professional-looking and fits in with your business's decor. These stainless steel racks are easy to remove for cleaning. This warmer comes with two lamps that illuminate your wrapped foods. This switch allows you to control the lights separately from the temperature. 85 - 185 Degrees F. The item "Avantco HDC-26 3 Shelf Commercial Heated Food Display Case Warmer Sliding Doors" is in sale since Tuesday, April 24, 2018. This item is in the category "Business & Industrial\Restaurant & Catering\Commercial Kitchen Equipment\Storage & Handling Equipment\Heating & Holding Cabinets".